Both of these teams know that when the Euroleague regular season ends, they will be winding down for the European campaign, so you have to wonder what impetus and motivation these teams will have in the game. 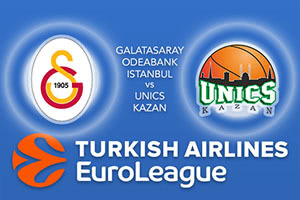 You have to think that the Turkish side will be keen to put a smile on the faces of their fan and with a 9-17 record, against the Unics Kazan record of 7-19, a home win will surely keep the Istanbul side ahead of their Russian rivals. It may not be the most exciting match of the week’s Euroleague action but there should be plenty on offer for neutrals to enjoy if they tune in. These sides have met on three occasions in the past and it is the Russian side who has won every game, holding a 3-0 record. When the teams met earlier on in this season, the score was 73-60, and there was a massive showing from Evgeny Voronov, who provided 22 points in the win. There is every chance that the home team will be relying on Vladimir Micov who has provided an average of 11.4 points per game this season while Sinan Guler has notched an average of 10.6 points per game this season. Alex Tyus has also broken into double figures, providing an average of 10.2 points per game. Keith Langford remains the top scorer in the league, with an average of 22.5 points per game, and he has been the player that Unics have looked too all season long. Art Parakhouski has provided an average of 11.7 points per game so far this campaign, as has Quino Colom. These are the players who need to do the damage for the Russian side in Turkey but to be honest, there will be some away players who are merely desperate to get the season over and done with. While there isn’t much at stake in this game, back Galatasaray Odeabank Istanbul at -5, which is provided at odds of 1.90. If you’re looking for the Over/Under market, go OVER 160.5 at odds of 1.90. Bet Now!